With each passing day, our reliance on portable electronics grows. These little devices are powerhouse computers that store our calendars, digital reference libraries, photo albums, tasks lists and just about everything else you can think of. Life before gizmos; can you even imagine it? In spite of our reliance on electronic devices, there is a downside. They consume energy like crazy and require frequent recharging using electricity. I know some folks that are so dependent on their devices that put them through a charging cycle twice a day! Therein lies the problem. With our reliance on smart phones, tablets, and eBook readers, a grid down power outage will leave us with a muddled mess of information that is inaccessible. Those hundreds if not thousands of documents, photos and eBooks will no be available until power is restored. Thankfully, in the past four years great strides have been made in the area of portable solar chargers. Not only have they become a cinch to use, but they have come down enough in price to be highly affordable. With that introduction, I would like to introduce you to the Marsboy 15W Portable Solar Charger. This easy to use solar charger is so simple that the operating instructions are printed on the cover. You can’t get much simpler than that. And the best part? I have one to giveaway for free to a lucky Backdoor Survival reader! 3.2 Which are the best oils for your survival kit? This article describes my top picks. Here is what you need to know about the Marsboy Portable Solar Charger. The Marsboy consists of a compact unit measuring 7.5 by 10 inches when folded and weighing just 1 pound, 10 ounces. It includes three solar panel that put out 15W. These panels are sturdy! While I don’t recommend it, I dropped a couple of rocks on one of the open panels and it suffered nary a scratch. There are two integrated USB ports tucked into a Velcro pocket. One is 1A and the other is 2.5A. For my tests, I plugged in an iPhone and iPad in simultaneously and they both began charging immediately. It is a good thing when that green lighting icon appears from the get go! Later I plugged in my Goal Zero battery charger and likewise, my drained, AA rechargeable batteries charged right up. There is one thing to keep in mind with solar charges such as this one. You do not want to keep your phones, tablets, and eBook readers baking in the direct sun. Luckily, smaller handheld devices can be tucked into the Velcro pocket while being charged and larger tablets can be shaded by the folding panels themselves. Which brings me to the next point: the panels are in a study case that will stand up, accordion style on it own. Flimsier panels will not do that. Although I had to provide my own cables, I saw that as an advantage. Some of the solar chargers I have tested in the past were a mess of cables with assorted tips that had to be mixed and matched to get the charging cycle started. These days you can purchase USB cables inexpensively (I like the Amazon Basics brand) so what I do, is keep a set in the Velcro pocket. Easy peasy. In my usual style, I leave it up to you to seek out additional specifications by taking a look at the product specs on Amazon. What you really need to know, however, is that the Marsboy 15W Solar Charger works and that it is easy to use. You do not need a PhD is engineering to figure it out. This is my kind of product. Okay peeps; here is the part you have been waiting for. One of you will win a Marsboy Solar Charger of your own. How cool is that? To enter the giveaway, you need to utilize the Rafflecopter form below. Select one or more of the options after signing in using your email account or Facebook, the choice is yours. The best way to start is by clicking on “Free Entry for Everyone”. After that, each option you select represents an additional entry. There are a number of different options so pick and choose or select them all. The deadline is 6:00 PM Pacific next Tuesday with the winner notified by email and announced on the Rafflecopter in the article. Please note that the winner must claim their prize within 48 hours or an alternate will be selected. You know the rule, one is none and two is one. When in comes to charging your electronic devices (which I fondly call gizmos), you need a secondary source other than electricity. The Marsboy Solar Charger fits the bill at an affordable price plus it is very easy to use. Just unfold it and plug in your devices. Easy peasy. Performance is best when the panels are pointed directly toward the sun, but if not, you still get enough juice to charge most devices; it just might take longer. This is a fantastic product that will make a fine addition to your emergency kit. I invite you to check it on on Amazon and of course, to enter the giveaway. Bargain Bin: Below you will find links to the items related to today’s article as well as some of my favorite prepping essentials. Marsboy 15W Solar Charger with Dual USB Ports: This portable solar charger is easy to set up and easy to use. With two USB ports, you can charge two devices at once which is a real timesaver. Well constructed and well priced. Amazon Basics USB Cables : I swear by these cables. They are not the cheapest but they are also not the most expensive. They just work! Kindle or other eBook reader: Are you surprised? If the grid is down, you are still going to want to have access to your eBooks and reference manuals plus some way to keep your mind occupied. I happen to have both a reader and an iPad and both can be charged using an inexpensive solar charger (see below). A basic Kindle Wi-Fi is only $69 and a Kindle Fire HD is as low as $129. Solar Charger for Standard Batteries: I use this Goal Zero Guide 10 Plus Power Pack for charging AA and AAA batteries using the sun. It works great with the Marsboy Solar panels. Inch Premium Glow Sticks – Assorted : These 4” glow sticks are fantastic! Each stick glows for 8-12 hours, and comes with a pre-attached hook and lanyard. They are well priced and hold up well when packed around in a pocket or handbag. For more information about glow sticks and chemical lighting, read 10 Reasons to Add Glow Sticks to Your Survival Kit. 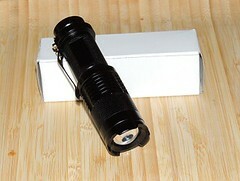 UltraFire Mini Cree LED Flashlight : FAVORITE! At the time of this writing, this one is only $3.40 with free shipping. It is super mini sized, bright and waterproof. Plus, it uses a single, standard AA sized battery. Which are the best oils for your survival kit? This article describes my top picks. I have trouble with the same things. Getting info from this site is so amazing, always. I really struggle with storing water. When our power goes out,there is NEVER enough to flush the toilets! You need a bath tub liner (not expensive) to fill for bathroom water. They hold a lot and hold up well. Having time and money to devote to prepping is the hardest thing for me. The biggest struggle I have is Energy for small devices , batteries drain too quick ,especially when trying to get info and lighting ..
Having the time and money to commit to prepping the way I want – and convincing dear hubs that we need to do this! The hardest part of prepping for me is practicing the skills I am learning. Book knowledge is great but the practical is more important. Being able to access my knowledge without having to look it up is my goal. With all the normal demands on ones budget prepping can take a back seat. So I look for prepping items off the beaten path. Garage sales, discount grocery stores, army navy surplus, trade with friends, barter. You’d be amazed at what can be found for nearly nothing. Big Guy has found lots of prepper goodies at garage sales. Biggest battle – is having the time to practice the art of prepping. Work 10 or so hours a day, always something to do at home, weekends filled with grandkids activities and then the stuff you gotta do to get ready for the work week ahead. Need to carve out more opportunities to camp, hike with bag, etc.! Thanks Gaye – appreciate your material. Looks like a very good solar charging device and worth adding to your preparedness supplies. Getting family onboard has been my biggest challenge thus far. Since I’m THE ‘prepper’ in my family, my biggest struggle is being prepared for everyone. Luckily it’s just myself, my husband, our adult son and to small pets. Solid information. Looks like a bargain and I trust your recommendations! haven looking at this for the past 6 months thanks. I struggle with water and power. I struggle most with getting my spouse on board. This is a great article. Thank you! The solar charger looks like a great device to add to anyone’s preps. Thanks for all of your information. My biggest struggles with preparedness efforts is not having much money and my husband not being on board with me. I’m fairly new to all of this, so I’m struggling with how to get started without feeling overwhelmed. I’m trying to balance the budget with the supplies, and this would go a long way toward helping. I worry about an IMP or a financial collapse. In either, should I have my debts paid down to keep someone from repossessing my home, or should I run it high and let the financial institutions take the hit? Any ideas? This would be excellent to have in my prepping gear! My biggest struggle is how to store water and getting my family in the same mind set. This one is for my husband for sure. Hope he shares. Water storage us a challenge as well as space for items. My biggest concern is knowing we have prepared enough for our very large family. Knowing how many cans I have of what. I used to keep a clipboard and change # evertime I use something, then I became inconsistent.Practicing skills is another, finding time. Finding room to store more than a few days of food. I have water, some food, some gear, lots of knowledge but I’m 65 with a bad heart. 10 minutes in the garden and I’m a sweaty mess with a thumping heart. My only option is to bug in. I have no confidence in my ability to protect my wife. Kids live far away, Neighbors are sketchy. No group to rely on. What can I do besides buy more ammo. Thanks for your info, the charger looks great. My biggest struggle is finding the time (and money) to get all that I need and learn how to use it. I would be so much more motivated if I had a community of like-minded people to plan and practice with, but I don’t, so it’s hard to say, oh I think I’ll sit here alone for 6 hours and try this out. Having your articles really helps. Two big struggles really, never enough water and getting adult children on board! Cost and having to choose between wants and needs. I struggle with finding enough money out of the budget to keep preparing and with the husband who doesn’t quite get it yet and thinks that nothing will happen. THe thing my family struggles with the most is food allergy preps. There are few choices available to us. Lot of beans and rice I guess. I struggle with saving water and getting help from family members. My struggles are keeping everyone and pets healthy to stay on the journey with me. It’s a big burden riding on my shoulders to be organized and wise enough to be their rudder in hard times. This is what I need, for camping trips, to keep everything up,and running. Especially my Kindle. Thank you for this opportunity. I struggle with lack of money. Trying to get items that you feel are real important without breaking the bank is near to impossible in some instances. FYI this is the reason I enter all your giveaways. You have super items that if I can win it is one more thing less to worry about! My biggest struggle is financial. I have canned tons of food from my garden (yay!) and saving water in scavenged soda bottles (love a good haul from a friend’s party), and learning all I can. But buying tech is just not possible. Money is my biggest obstacle. So trying to stock pile what i need for my family is very hard. Money is a problem for everyone but if you check the local BOGOs (buy one, get one free) you’ll have one for your prep stash. One or two a week will get you there in no time. Be proud that you’re doing what they need. Money is my big problem. Another is figuring out electronics-computers,tablets and understanding all of the terms and abbreviations to be able to fit them into prepping. Also figuring out a solar charger that will do it all. Currently a lack of space and nosy neighbors, the joys of apartment living. My biggest concern is getting my husband to continue helping me prep. Plus, I just found out I am diabetic, and am very depressed over that. I’m new at prepping! Would love to start out with quality items! Had a portable charger but it broke. need 1 to travel. Great to see a review on a solar charger from someone I trust. It is something I have been wanting for a while. Glad to see I’m not the only one who struggles most with finding the time to plan for the future while also trying to get what needs to be done NOW done! I believe I read where you are in Arizona? Where? I live in Phoenix and would love to meet you if you are close by. You have picked a good time of year to come as it has cooled off. Right now keeping focused is hard but know there are items we need to still get and do. Love your site and blog. Enjoy Arizona! My biggest struggle is time to organize everything I have. And my other struggle is finding good affordable solar power. Finding to time to finish all my projects with limited funds. I struggle with making a plan and keeping to it! What a great giveaway ! Thanks. Wow! i have been wanting a solar charger. I think this one fits the bill perfectly. I really appreciate your information. We are an elderly couple with one son (who works all the time) and neighbors who are in about the same boat we are in. There is little interaction except at our local church. Not many of us are able to ‘prep’ but we struggle to do the best we can. We worry about our grandchildren and great-grandchildren and the kind of world that they are inheriting. Again, thank you for all your information. We rely strongly on your articles. This solar charger appears to be just the item that would benefit us! My biggest struggle would be potable water. Altho I am within 1/4 mile of a lake, I would not drink the water without a lot of treatment! My biggest struggle is finding enough money to do all that I need to do. Being on a fixed income with no increase except for the cost of everything going up is really pinching my funds. I struggle with getting all my “stuff” organized. Since my family is not on board it falls on me alone to find the time. I struggle with figuring out how best to cover the larger things–water, power, heat, sanitation, communication, self-defense–while on a budget and with a family who is not really on board. I seem to always be finding new gadgets that I have got to have! There is always something newer/better/more gee-whiz that I read about that I end up wanting. That can get very expensive, so I struggle trying to limit myself to only those items that are really necessary. This solar panel looks really handy. I’ve been working hard on building a food supply. Does anyone have advice on refrigeration? This looks like a great prep! I struggle with spending too much time reading about what I should be doing and not enough time doing! Not knowing what to prepare for. Financial collapse, EMP, etc. Some basic preps are the same but it is unclear what is most likely to happen. My biggest struggle area is storage. I just need more room! I’m also worried about medications and the lack of them if SHTF. Having space in a small apartment and money to devote to prepping is the hardest thing for me. My biggest struggle is organization of preps and having the space for it. I really enjoy the information you provide. Being unemployed; not having money to buy certain stuff. Then Having the space to store stuff. I struggle with information overload. After reading and researching about the different components of being prepared (food production, food and water storage, personal protection, etc, etc.) I end up jumping between the different areas too much and not really feeling that I’ve accomplished an adequate level of preparedness in any of the areas. Space to put things and store things away is definitely a big struggle. I struggle with food and water storage. I really wish my husband was more supportive with certain preps. He’s okay with what I do,but trying new things ie solar panels or things of that nature he is a little more reluctant . I have others that think it’s a great idea but really don’t want help with long term plans. I feel at times that I am the only one who is concerned with our well being. Finding a way to convince my wife that we need to do this. I’ve been quietly stockpiling food, water filtration, heat and light but I need to get her on board as well. As always, Gaye, you are spot on with that solar charger. We’ve been with you a long time and are doing pretty darn good on our prepping. Word around the neighborhood is that its an important thing to do and I occasionally hear another is working on prepping. I’m in love with that solar charger and need it, I mean … I need it! Send it to me. Glad you’re in AZ where my BFF lives. Hope to see you both soon. My biggest issues are money for preps and ways to store it in an apartment. We can always use additional ways to keep our electonic devices wirking in an emergency. Solar recharging has always been one of the best ways to accomplish that. It’s a struggle when you’re the only one among friends and family to want to plan or prep. It would be helpful if they were on board but I do a little (for myself) at a time. I’ll get there eventually but I won’t have enough to support them, that’s for sure. But I really need to do a complete inventory to verify what I have and what needs to be added to or replaced. Right now I’m pretty sure I’m at 16-18 months of food, and while I only have 45 days of water on hand, I have enough Berkey filters to last me 20 years, so assuming the river down the street doesn’t dry up I’ve got water taken care of. A few issues back, Gaye Levy reviewed an inventory notebook that was really good. Look for it or start your own. As I add to my stash I mark the item so I know it’s listed. Computer lists are fine but print out your revisions for when the SHTF you’ll have a paper copy on hand. I would say my biggest struggle is to stay consistent and balanced in preparations and life. It is far too easy to swing from complacent to consumed and back. The biggest struggle with prepping is space. There is never enough space to keep everything organized. The other problem right now is that this entry thing is not taking my information. Keeps telling me it didn’t get my information. Sometimes it gives the entry, sometimes not. Once it gave me the entry on a tweet but I entered on Pinterest. I’m not on twitter, so I didn’t enter there. So sorry you are having a problem with the Rafflecopter. You can attempt to clear your browser cache to see if that helps. Instructions are here: //www.wikihow.com/Clear-Your-Browsers-Cache. If that does not work, contact support at [email protected]. I hAve been wanting to learn more about solar so this review was timely.Thank you for the chance. For me it finding exactly what I need to gather to prepare. And, food is an issues since there are others in my household that have food allergies and makes finding prep food to store difficult. I struggle with how to get started. I have a few preps but feel totally disorganized. The biggest struggle for me, as so many others have mentioned, is financial. Living paycheck to paycheck makes it difficult, but not impossible. My biggest problems are heat & storage for supplies. Thank you so much for your giveaways! Love your columns. The biggest issue I have with prepping is funding to do so,and I reuse/recycle anything we can without making a mess of it. Second-hand stores are a real boon to finding items I can use, and also to donate to what I have that I can’t use.